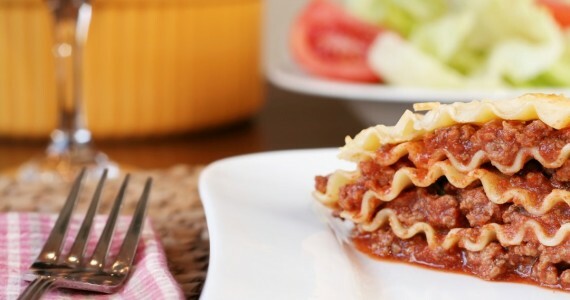 This is the perfect, classic lasagne to satisfy a hungry family. Sauté the onion and garlic with the olive oil until soft, add the celery and carrot and soften them. Add the minced beef and brown. Add the tomatoes and mixed herbs. Stir together. Turn the heat down and cook for 3-4 hours either on a low hob or in the oven 150C. Check seasoning adding salt and pepper. Secondly prepare the all-in-one white sauce. Add the milk, butter and flour to a large pan on a medium heat. Stir continuously until the sauce thickens to a smooth texture. Stir in the cheese, leaving a handful to sprinkle on the top. Add salt and pepper and cook on a low heat for 10 minutes. Smear the bottom of an oblong oven dish with the Ragu sauce. Pour over a layer of white sauce. Place a layer of raw Lasagne, cover with Ragu sauce then a layer of all-in-one white sauce and a sprinkling of cheese. Repeat for 4 or 5 layers. Coat the top layer with just all-in-one white sauce and some cheese, ensuring the Lasagne sheets are completely covered. Place in the oven and cook for 30 - 45 minutes. Check with a sharp knife to make sure the Lasagne is cooked through. Allow the Lasagne to stand for 10 minutes before serving. “I have been using and recommending Rizopia pasta for many years as it is not only the best tasting gluten free pasta I have ever had, it is also the healthiest one I have found. I serve it at my healthy eating workshops and people are so surprised it isn't wheat.” Julie Silver.